At a casual glance, it may appear Aprilia has adopted the sledgehammer approach to its ever-improving MotoGP outfit. New paintjob. New riders. Rip it up and start over. But look closer and it's quite the opposite. A change of personnel at management and rider level there has been. But on the whole this has been a winter of steady evolution, not revolution. For the first time since its return to MotoGP in 2015, Aprilia's riders will line up in Qatar aboard a full-grand prix spec machine that has completed a winter's worth of testing. Not only that. Aleix Espargaro has been fast, showing his preseason target of breaching the top five isn't unrealistic. Along with class rookie Sam Lowes, the all-new line up is delighted with aspects of the new RS-GP, its ability to perform on used tyres chief among them. It didn't need a genius to see development was heading in the right direction in 2016. By the autumn months, riders Alvaro Bautista and Stefan Bradl were qualifying for Q2 and top ten finishes became the norm - a remarkable feat when both riders only tested the all-new RS-GP for the first time four weeks before the first race. Puzzling then that the factory had chosen to replace Bautista (one world championship, three MotoGP podiums) with Espargaro (no world championships, one MotoGP podium), while injury prevented Lowes, who saw his Moto2 title charge fade dramatically away, from starting off life as a MotoGP rider on the front foot. The news that Aprilia was lending full factory support to SMR's World Superbike effort gave credence to the suggestion that factory resources may be stretched. That KTM pinched Marco Bertolatti, essentially the #2 in Aprilia's MotoGP project, at the very close of the year meant there was a danger that momentum, built up incrementally over the previous 24 months, could begin to ebb away. A winter's worth of evidence suggests the contrary. Considerable tweaks to certain areas of the package - namely the chassis - have given riders greater front-end feel. And in Espargaro, Aprilia has a rider who, from his time at Suzuki, knows a thing or two about pushing a factory toward MotoGP's top six. "We still need to work but it's definitely much better than what I expected," said Espargaro. Given racing manager Romano Albesiano's experience with aerodynamics, a factor that could work to Aprilia's advantage, the Noale outfit goes into 2017 on the front foot. 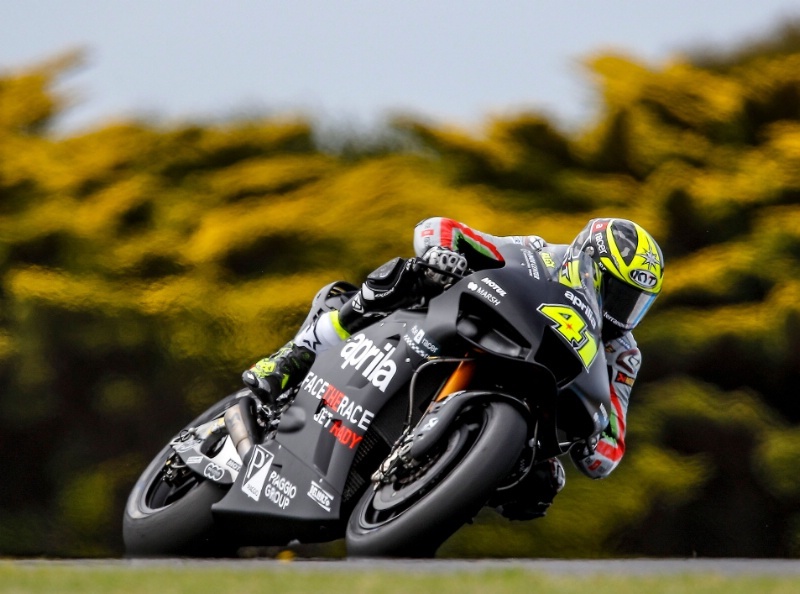 Aleix Espargaro debuted Aprilia's new aerodynamics package at Phillip Island. pic: Gold&Goose. The first laps on any new machine are always critical. In those five minutes, the magnitude of the task of bringing a bike to the required level soon becomes clear. Several corners in to his very first run at Valencia on a cold November morning, and Espargaro's KYT lid concealed a smile that stretched ear-to-ear. "The first impression is important," he says. "And the first impression in Valencia, on the first run, was very good because I was able to brake super late and hard and with a lot of stability." An updated frame, brought to Sepang, has aided its riders with feel even further, and has been a welcome change for Espargaro's aggressive, late-braking style. "I need to ride with the front brake very aggressive and with the Aprilia you can do it," he says. Lowes also spoke of the increased feeling the new chassis brings through the handlebars. "With the old bike there's less [weight] transfer, less feeling on the front. With the new bike there is more transfer so you should have the sensation that you're pushing down into the track, which is what I'm looking." Increased power through the engine has given both riders a boost, although Espargaro found addressing the electronics settings have also helped in that area. "They said that the bike doesn't accelerate but they use a lot of power reduction, a lot of power control so I released a lot the anti-wheelie," he explained. "I release a lot the traction control and I give a lot more power to the bike." As a result, the rear of the bike has become slightly nervous, a feature that still needs addressing in the spring of the year. For Albesiano, tweaking the chassis has been given him the greatest contentment. "The part that makes me most satisfied is the chassis development, because the new bike is definitely a step forward," he says. "Aleix said that the first time he tried it. He was very clear. Sam said it the day before yesterday and was so happy when he jumped off the bike. He really enjoyed it so this I think is the best answer the rider can give." Three crashes in three flyaway races all-but-ended Lowes' dreams of adding another world title to his collection. But his misfortune didn't end there. A fast fall on day one at the Valencia test had the Englishman knocked for six. Lowes then completed just a handful of laps at a rollout at Jerez a week later. Certainly not the start he had anticipated. 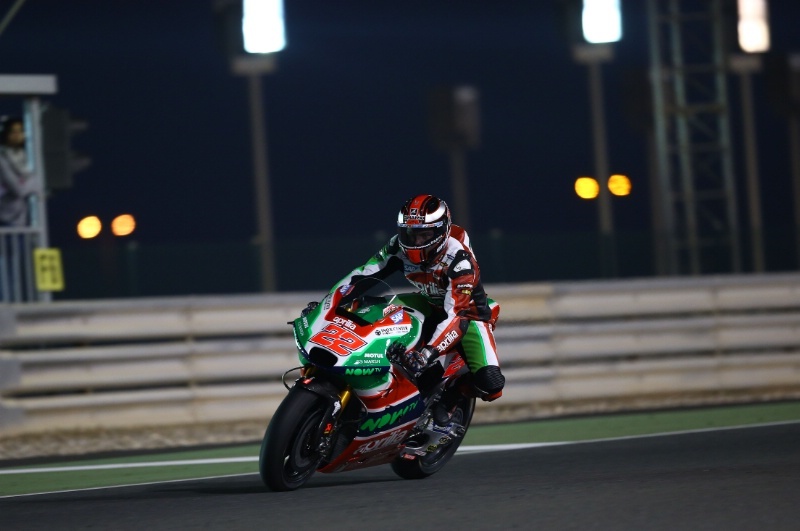 Sam Lowes had his first taste of the 2017 Aprilia at Qatar. And his pace on used tyres wasn't far away. pic: Gold&Goose). Not to worry. Aprilia didn't want to see Lowes attempting to walk before he could crawl. The decision was made. He'd use tests at Sepang and Phillip Island to get the feel for a 260bhp prototype, using solely the '16 bike - as he had at tests before Christmas - with the odd '17 part thrown his way. Then at Qatar, once the factory had decided with some certainty on the specifications of the RS-GP, Lowes got his chance on the new machine. "We couldn't ask him to judge the project," says Albesiano of this decision. "He had no reference. Also we would put pressure on him so Aleix did this part of the job, which is not easy. Once this part was confirmed, [Sam] tested the bike as well and it's good." So used to being a name at the top of Moto2 testing timesheets, Lowes has also refined his preseason approach. "The plan has been, 'Let's just keep everything inside. This is our little group. Don't worry about what people say. Don't worry about the position. We know you've not used this tyre. We know you've not used this engine.' These things make a big difference. Don't get me wrong. When it gets to the racing it'll be a totally different ball game. It has to be. But it's good, the pressure isn't on me now. As long as the [performance] line is going [up steadily], that's the plan." One garage observer noted Lowes' reaction at the close of testing at Sepang. Seeing his name next to 23rd place on the timing screens, the Englishman stiffened slightly as Albesiano approached, anticipating the exchange of a few stern words. However, the Italian had come over to offer his appreciation of his rider's efforts that day. Lowes had after all improved his lap time and reduced the gap to the front. Job done. Tension made way for enthusiasm in a matter of seconds. Clearly both team and rider know a rookie campaign in MotoGP is not to be conducted at a sprint. Lowes has been the first to admit he has not yet found a means of extracting the best from a new tyre. But his pace on old rubber is good. And a set-up change on the final night of preseason testing pointed him in a positive direction. "I nearly came in after my out-lap just to say to the guys, because we had made that big a step." Should he be in the midst of a fight for points at race one, Lowes will be on the right path. By his own admission, Espargaro was moved to tears this time a year ago. Such were his struggles with Michelin's new 17-inch front tyre racing had lost all sense of fun. Now that confidence has returned, the Catalan - insulted by the way in which he learned of Suzuki's signing of Andrea Iannone last May - is more motivated than ever to begin this new adventure. "What I like a lot is that a lot of people told me after leaving Suzuki and now going to Aprilia is two steps down," he says. "So this gives me a lot of motivation. If we are able to put the Aprilia in the top five, it's going to be unbelievable. I'm 100 percent sure we will achieve it. I trained more than ever in my life this winter. I've lost three kilos from last season. So I'm fully ready to get aboard this project." With Lowes aiming to close the gap to Espargaro as the season wears on, Albesiano was not getting carried away when laying out Aprilia's aims. "We have to be very quiet [and] realistic. The competition is crazy. It's unbelievable. But I hope we can have a better performance in qualifying and to keep the top ten for the first part of the season. Then during the season we should grow up again." Blending the mix of proven experience, tenacity and steady evolution within its ranks, Aprilia may have unearthed the key to MotoGP's top six. Another step forward beckons.